New housing and migrants: some evidence | Cornwall – a developers' paradise? A week or two ago Phil Mason, Head of Planning and Regeneration at Cornwall Council, made the astonishing claim on Radio Cornwall that new housing projects attracted no in-migrants. Instead, people moving to Cornwall were buying into the existing stock and all the new houses were actually being built for current residents. Most people who have had any business on the new estates springing up around our towns will know this claim is ludicrous. But unfortunately it can’t easily be countered. In these days of evidence-free policy making in government, central or local, there are no publicly available surveys of residents of new housing schemes or their previous addresses. This lack of evidence is of course very convenient for the likes of Phil Mason, who can then come up with any claim, no matter how absurd, safe in the knowledge that it can’t be exposed as a fabrication. This behaviour is encouraged by a supine and stunningly innumerate media that let our political elites get away with all kinds of nonsensical statements, however bizarre. In fact, there is some evidence about the origins of residents of new open market housing schemes in Cornwall. Unfortunately, it dates from almost 30 years ago. In 1986/87 Cornwall County Council and the old District Councils got together and carried out a ‘new household survey’, looking at new private housing developments across Cornwall that had been built in the ten years from 1976 to 1986. This resulted in data from over 3,000 households, a very respectable sample size. And what did that survey discover? Almost half of households – 44% – had moved directly from outside Cornwall to take up residence in new housing. In Caradon, which had the best response, this proportion was 62%. Housing with the highest proportion of households from outside Cornwall were found, not unexpectedly, in coastal and rural places and Newquay, along with east Cornwall. On top of these direct migrants, another 11% of households in the new houses had moved from other places in Cornwall but had only arrived at some point in the previous decade. Phil Mason now claims that nobody from outside Cornwall is attracted by new housing, despite clear evidence houses are being deliberately marketed to appeal to upcountry buyers. 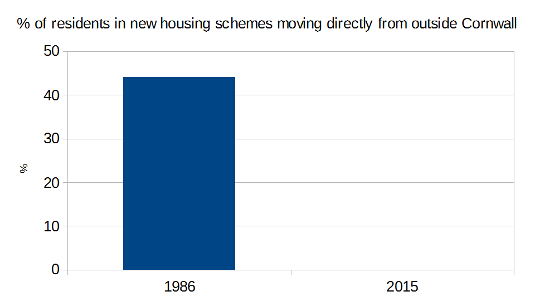 If almost half of residents in new open-market housing schemes in 1986-87 had moved from outside Cornwall then there must have been a remarkable, indeed incredible, turnaround since the 1980s. Then, new open-market housing proved clearly attractive to in-migrants; now we’re assured it isn’t. Isn’t it about time the Council commissioned another similar survey? Or perhaps time for an independent enquiry into the use (or misuse) planners in Cornwall are making of statistical data. This entry was posted in discourses and ideologies and tagged dodgy data, Mason. Bookmark the permalink.